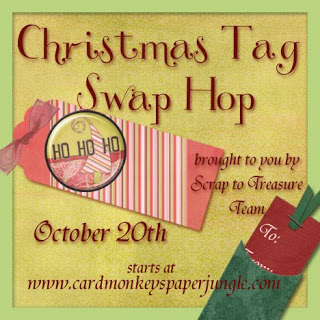 CardMonkey's Paper Jungle: STT Team Tag Swap Blog Hop -- It's Christmas! It is my pleasure this month to host the Scraps To Treasures Team's blog hop, and today, it's a Tag Swap. Our sub-theme is Christmas! Can you believe Christmas is coming and it's right around the corner? Christmas tags always come in handy, that's for sure! You can use them on gifts, or even as a gift ... as a card or on a card. I enjoy making tags to allow me to try out new techniques without wasting a lot of paper. I also enjoy them because they're quick to do -- and in this busy season, there's a lot to be said about instant gratification of a project DONE! cardstock -- thick enough so the coloring won't show through. 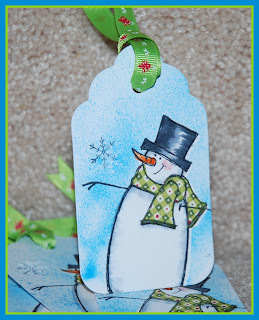 I used a Sizzix tag die I purchased on eBay for dirt cheap ($6). my mask to the next tag right away. save the leftover scarves with the stamp to use them at another date. mixed with a blender pen, and voila! black Memento ink, and tied a snip of ribbon at the top. The ribbon comes from the "Really Reasonable Ribbon Club"
seasonable ribbon automatically (auto-pay, too) each month. When you read my description (caption) of how I made these, it will sound like it took forever to make 8 of these tags for the swap -- but not so! Once I figured out what stamp I wanted to use, the whole process was done in less than 40 minutes. BUT WAIT! I have to tell you about BLOG CANDY! First, the HOP special: Two randomly chosen commenters who have left posts on ALL of the Christmas Tag Swap Blog Stops will each receive a set of tags (one of each tag seen on the hop) ...in other words, you'll get our swap, without having to kick in a tag of your own. What a deal! READY to MOVE ON? 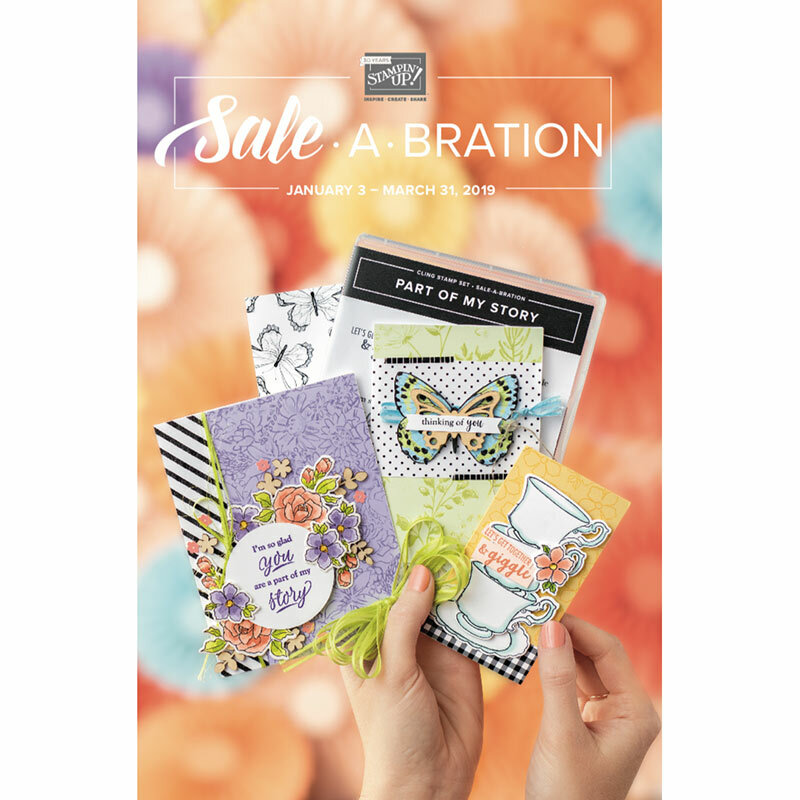 Here is your next stop: It's LISSA MARIE at So Many Crafts! Here are all of the stops in case you get lost. If you find broken links, please e-mail me at cardmonkey@comcast.net so I can fix them ASAP. THANK YOU again for visiting us today at the monthly Scraps To Treasures Blog Hop! I really love your snowman tags! Beautiful work! Oh my gosh. I started a sketch of your tag to work on some today and it sparked a lot of other tag ideas. TFS. 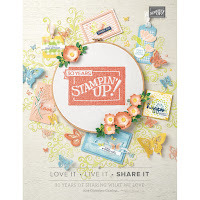 Can't wait to see the rest of the hopper ideas I totally need a crafting jumpstart. I've been in a crafting slump lately with too many life problems not enough time. I just love your snowman, he is adorable! Great job with the masking! T craft or to hop, that is the question. But, it's NOT a halloween hop (yeah) so i guess i'll hop. Your tags is adorable...and your instructions easy to follow. Thanks for sharing. P.S. i follow hops for the inspiration and hopefully find new blogs to follow. Blog candy is just the tag on top of a gift. Your tags are wonderful and cute - and to make 8 tags in 40 minutes is exciting - I like very nice things to create in less time - what a great idea! Thanks for the hop! Your tags are adorable! Love that little snowman! 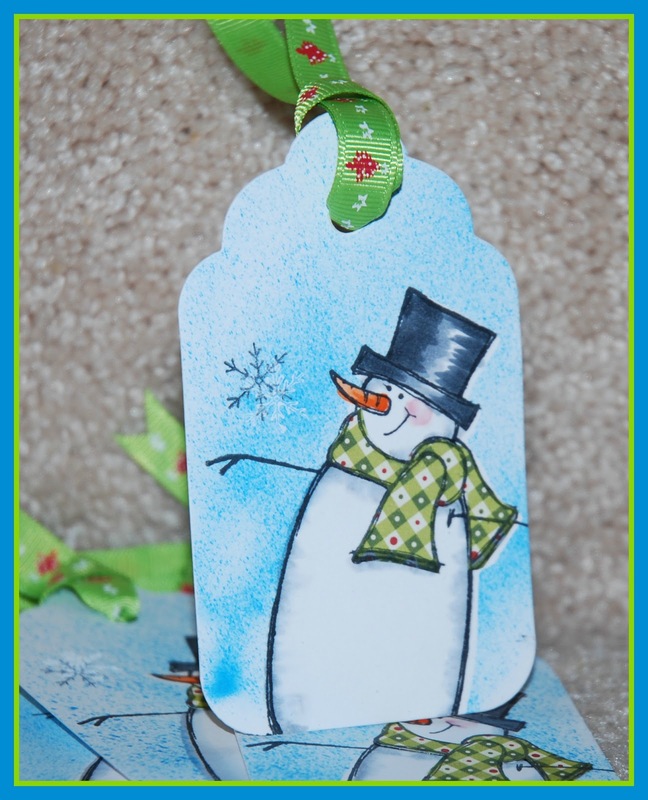 I am crazy about tags and your snowman tag is adorable! Love the way you colored him and that misted background! Already a follower of yours! Very cute tags! I love friendly snowmen! I'm already a cardmonkey follower, and you may reach me at dpntdn@yahoo.com Thanks! Super cute tag! I love snowmen! This could be used all winter and not just for the holidays! Very cute tags Ellen, love the snowman. Your tags are so sweet! I love the layer look of the snowflake, even tho you said the white was a fail.. I am really excited to be doing this hop, as a matter of fact, I made my first threee tags my self today, they are soooooooo fun, I may be hooked already:) Your are super cute! You were way to quick for me this month for the blog candy! That's ok, maybe next time. Well I thought i would stop by and take a peek since i haven't slept at all tonight. at least you get some close family time in times like this. Still at my parents house, just waiting. I love this little tag. Great colors and style!